What Next For Camelot After Failed Triple Crown Bid? After months of anticipation and a build-up to a race that for the first time in many years had put UK racing's oldest classic back in the headlines, Saturday's St Leger failed to deliver what every fan had hoped to see, the crowning of the first "Triple Crown" winner since Nijinsky in 1970. It was up to the 2/5 favourite, Camelot, to achieve that feat but the Aidan O'Brien trained Colt sadly failed in his attempt to re-write the history books as he could only finish second to the Godolphin trained Encke, who was a 25/1 outsider in the nine runner field. Encke drew a line through the formbook and the third place he achieved in the Great Voltigeur Stakes at York last month, improving out of all recognition to comfortably win this stayers classic by ¾ lengths from the favourite. It confirmed Al Zarooni as a major player in the training world and puts him arguably ahead now of his training team mate of Godolphin, Saeed Bin Suroor, who had previously saddled five winners of the 1m6f Classic for the "men in blue". The result also demonstrated the wonderful ability of jockey, Mickael Barzalona, who was winning his second British Classic after winning the 2011 Epsom Derby on Pour Moi. It was Barzelona's enterprising decision to take up the running two furlongs from home that got him first run over Camelot and proved vital in causing the upset. The defeat will cost Coolmore's Stud operation millions in potential stud fees and although the son of Montjeu will still stand for hefty amounts, it won't be anything near the amounts they'd have been able to command was he retired an unbeaten "Triple Crown" winner. 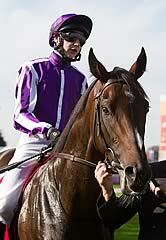 The big question now is what will O'Brien and Camelot's owners decide the future holds for him on a racecourse. No decision has been made for the three year old and a bid to redeem himself is surley the only reply following this setback. One option would be to run Camelot in the Prix de l’Arc de Triomphe at Longchamp in three weeks time but the fact that he's been removed from the marker over the weekend would suggest that is unlikely now. Another possibility would be to go for the Champion Stakes at Ascot but that will not happen as it would mean a drop in trip and with a reputation to restore, he is unlikely to do so up against Frankel. The final option could see him go to America for the Breeders Cup Turf, for which, if nothing else, he will have plenty of preparation time and a win on the International stage would do his stud fees no harm at all. The other two options would be to draw a line under this season and keep him in training as a four year old in 2013 or to retire him. Retiring him would be the safest option but one that would set about flat racing critics calling the sport's best contenders unadventurous. Which, they cannot be blamed for, as fans, we want to see the best horses appearing year on year, as we are accustomed in the National Hunt, but when there are such rewards to be had at stud, it is little surprise that the men with the power opt for the rewards over maintaining racing's profile. O'Brien has not been scared in the past of keeping some of his better three year olds in training as four year olds but that is often if they have faltered earlier in their careers. In all likelihood, Camelot will go the same way as Rock of Gibraltar who retired after losing his unbeaten run on his final start aged three. Credit has to be handed to Ballydoyle for their decision to run Camelot in the St Leger given only 15 horses have ever achieved the feat of winning the "Triple Crown" in over 200 years and these days very few will even try. For that reason O'Brien ought to be applauded for making the attempt but it almost certainly means that it will be a very long time before anything else makes the attempt. Sea The Stars was the last 2000 Guineas and Derby winner who could have gone to Doncaster but instead opted for the Arc and that now is sure to be the way of most other "potential superstars". In the meantime, where Camelot will be next seen, if at all, remains a question we await to find out the answer of.